This is my completely honest review of Team Z's K member kit. I'm going to say a couple disclaimers before I get too far into this. I did not get this kit on the ground. I mocked the kit up and decided to go with Maximum Motorsports instead. So, with that being said, I have no idea how these feel when driving. This is an INSTALLATION review and I will try to be as thorough as I possibly can. I am still working on putting my car together, so there are parts that I still have not had time to get around installing. So, let's get started. 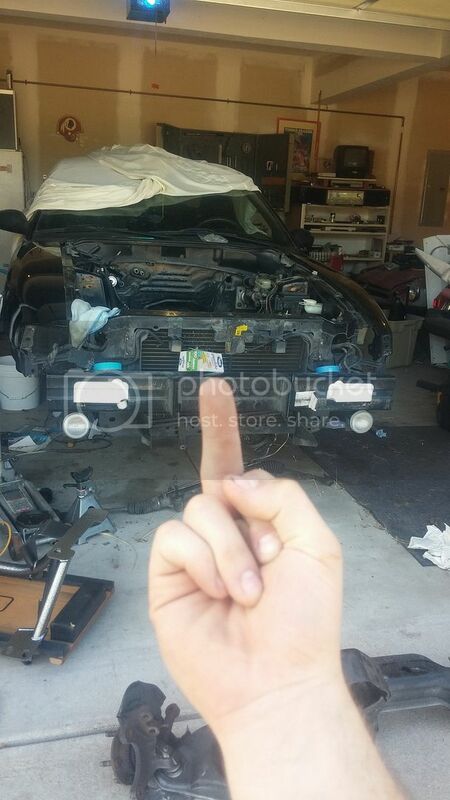 I purchased my parts through a vendor I found on Facebook. He made stuff seem pretty easy and straight forward so I would be able to get everything bought / purchased in one place. From him, I ordered the following parts : Team Z K Member Kit (Includes K member, A Arms, Coil overs), Team Z Caster / Camber plates, Team Z Sub Frame Connectors, Some stainless steel brake lines, Maximum Motorsports Bumpsteer Kit (tapered) and Bilsteins from Maximum Motorsports. 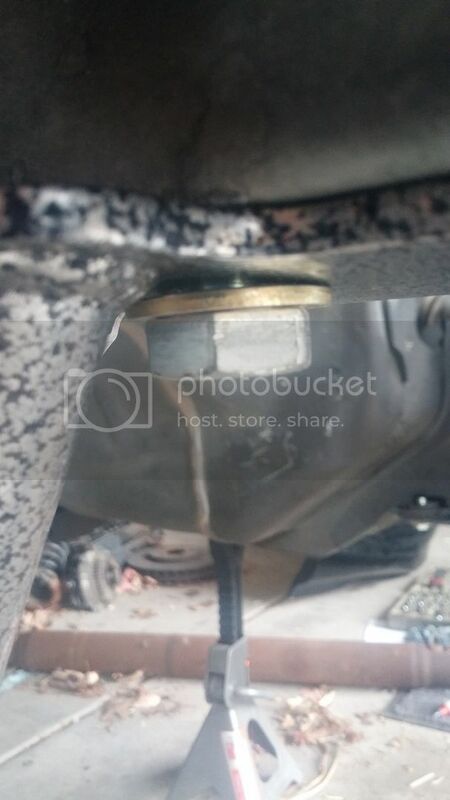 I had previously purchased offset bushings for my steering rack, I'm almost 100% positive you will need those. The K member Kit; First impression on this was a wow factor. Man, this thing saves a ton of weight! Something like 40lbs off of the front. it's easy to tell when you lift the stock K member compared to the Team Z K member that there is weight savings. I went ahead and purchased the hardware kit from Team Z so I would have fancy new hardware that would look great with the new K member. If I were to go back, I would have saved myself some money and went to the hardware store for the grade 8 hardware that was included. I forget how many bolts and washers came with, but I know I could have walked out of the hardware store with less invested. Installing the K member was relatively easy. It's very light weight so even one person can do it if you are lacking a set of helping hands. My problem that I ran into, was that on the driver side there is a ground from the block to the frame that is covered up by the K member. I have not seen this in any other posts that I have read about Team Z, so I figured this would be worth mentioning. It's not the end of the word, because finding another ground wasn't that hard. As the K member is bolted up, you will notice that some of the washers will hit the welds on the K member. The solution to this is notching the washer where the weld is so it won't hit it anymore. Once again, not the end of the world. But, it would be nice to have this mentioned so I would have known this was coming. My first impression of the A arms was that they were very noisy. I'm a genius and I had had zero experience with suspension prior to this, so I figured I would torque down the A Arms to spec without having a load on them. I have since then learned that you will want to tighten them while the car is fully loaded! Factory torque specs were an outrageous 190lb/ft . P.S. Don't torque them that high. I caved in one of the bushings on the passenger side when I torqued them down. Team Z sent me new bushings and inserts free of charge, so that was awesome of them! At the time of me ordering the front end, i was told that the Coil Over kit would fit Bilsteins. So, i trusted the seller thinking that he knew for a fact that they would fit bilsteins. When my parts came in, they did not fit. The "notch" was not big enough to fit over the strut. The "fix" for these was to notch them larger so they would fit over them. I did not want to cut into a new part, so I'm sending these back in favor of the MM kit that will fit properly. They are a bit too small as seen in the picture. Since Team Z sent me new bushings, I took both sides apart since they were both VERY noisy. I will post a link to how bad they were when i torqued them to 190 lb/ft. I put the A Arms back on and did "ratchet tight" and then added another 90*. Another word of advice.. Use a white lithium grease on the bushings / inserts when you put them back together. This TREMENDOUSLY helped with my noise problem to the point where it is almost non-existant now. Awesome. A arms are on! Time to check out my steering rack and try and get that on. THIS is where I had / am still having the most problems. 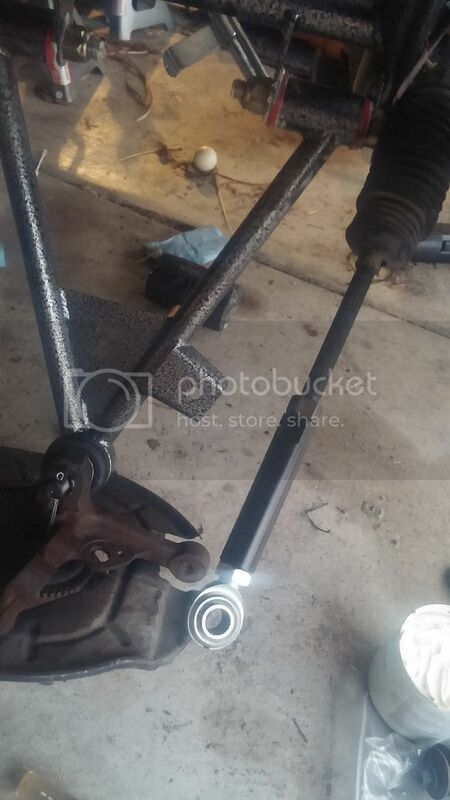 Upon installing my steering rack offset-bushings and getting it slid onto the K member, I was surprised to find that the stock bolts for the steering rack are 4-6 inches too long! Surprise! I hadn't read about this either in any of the threads that i have seen. No biggie though, because I went and picked up new hardware at the store. (The correct size you will need is 1/2 x 5'). So, I get back from the store and get the steering rack bolted up. The only things about this that scares me now is that there is almost no gap between the passenger side tie rod / boot and the bolt for the A Arm. See how the steering rack is a little too close for comfort? I figured it was normal and went about my install. Next on my list (this is sort of a continuation off of my "steering rack" issues) is my problem with my tie rod ends / bumpsteer. Due to the shift in the position of the steering rack that Team Z uses, your passenger side Tie Rod end / Bump steer kit is too short. 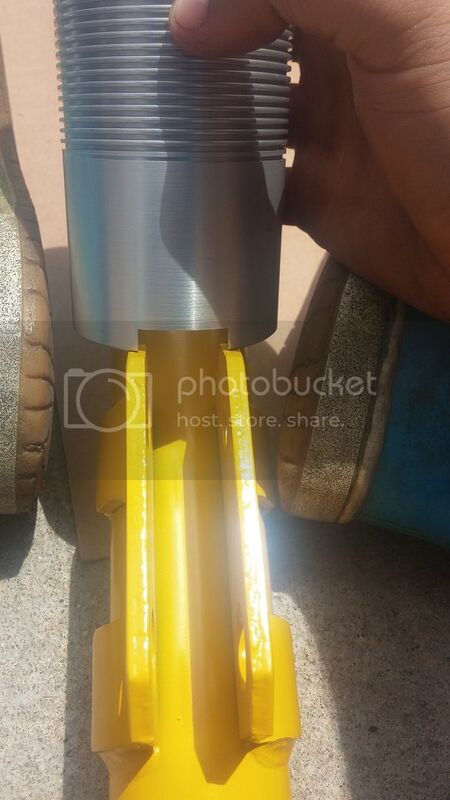 Team Z's fix for this is to cut your tie rod shorter so that your bump steer kit will alight with it correctly. I had not heard of this problem before either and I was very surprised to see it happen. I have been in contact with both Team Z and Maximum Motorsports about this and this is the only solution that they can come up with at this time for me. 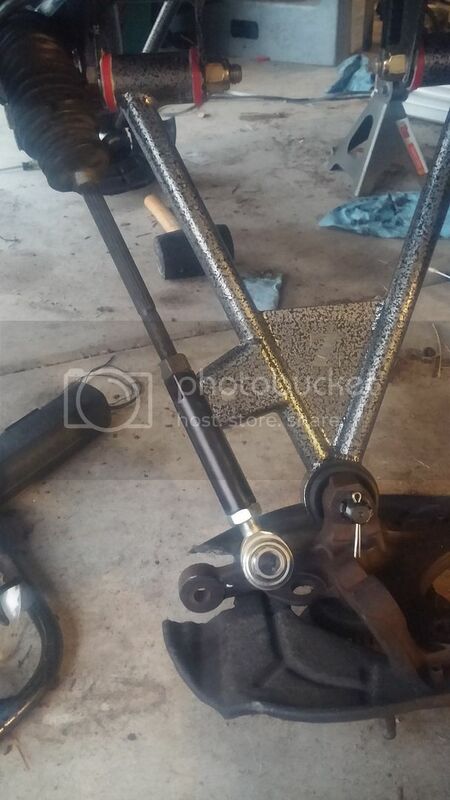 This is quoted from an e-mail sent to me - "The issue with the uneven adjustment of the tie rods is due to the placement of the steering rack bosses on the k-member. Team Z apparently moves these bosses on the k-member from the stock location to increase clearance between the steering shaft and headers. This creates steering geometry problems which should not exist and makes it difficult to get the correct thread engagement at the outer tie rods. You haven't done anything wrong. This is just how their k-member is constructed." This is the point where i decided that i was going to go with Maximum Motorsports. My buddy has a newer cobra and said that everything fit perfectly without modification... that's what i'm looking for so that's what i'm going with. Nothing against Dave and Team Z, but with all the problems i've been having, i'd rather just go the route that would be less of a headache. Both companies had GREAT customer support. And the parts that i got were good parts, they just weren't working for me or my car and i decided to go another route. If Team Z's parts were bad, they wouldn't be running such a successful company like they are. As i said, this is MY opinion and my installation review. This is not a full-review on how this stuff handles. This is how easy (or hard / how much of a headache) it is to put on. If you have any questions, feel free to ask me and i'll answer them to the best of my abilities.